Follow up on climate sensitivity studies on sugar cane. 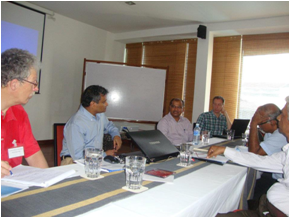 We had a useful meeting in Negombo following the CCAFS meeting on developing seasonal climate forecasts and crop models in April 2012- The main outcome relevant to AgMIP-SL from the CCAFS meeting is the outline proposal developed by the 5 Sri Lanka participants (2 from NRMC, one from RRDI, UoP and FECT) for training and capacity building for crop modeling for rice and maize for the next two years . The resource person for the Sri Lanka proposal was Rob Lokers from Wgeningen University and Alterra who oversees the IT side of the crop modeling operations that are going on a Europe wide scale. Whether that gets funded and there is follow up is uncertain. 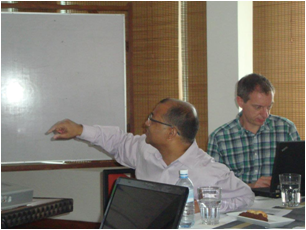 CCAFS South Asia coordinator (Pramod Aggrawal) is involved with AgMIP in an advisory capacity so there shall be some coordination. We followed up on all of the above agenda at least briefly. – Introductions – among international resource persons and Sri Lanka team members, Discussion on potential contributions from international resource persons. 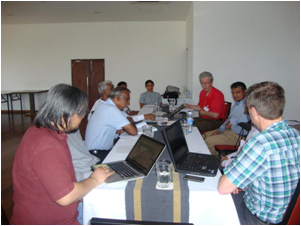 – Review of key presentations from AgMIP South Asia meeting at Hyderabad. We did not spend time on some of the other topicsl such as economics, climate and capacity building – because of the composition of the attendees and also because we think that crop modeling and IT were the areas needing focus. We am grateful to Amor, Kees, Rob, Nareshkumar for taking a whole morning with us and making some really valuable contributions and learing about the program and expressing their willingness to support us into the future. I also have to thank the SRI and Ruhuna folks for coming a long way for the meeting.